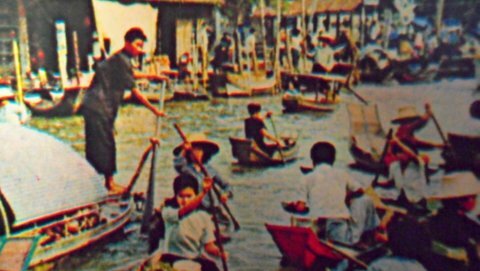 The Chom Thong Museum is a Bangkok Community Museum preserving the memories of the way of life in Chom Thong, an old district on the west bank of the Chao Phraya River since the Ayutthaya period. The museum is located in the grounds of Wat Ratcha Orasaram Ratchaworawihan in Rama II Road. To get there, please see map to the Chom Thong Museum. Let’s take a trip down memory lane as we view the displays in this museum to have an idea of what life was like in the Chom Thong of the past and what remains today. Chom Thong is a very old district that’s located between the estuary of the Chao Phraya and Tha Chin Rivers. The district was named after Wat Chom Thong, an old temple in the district dating back to Ayutthaya. Please see map for location and size of Chom Thong in relation to Metropolitan Bangkok. 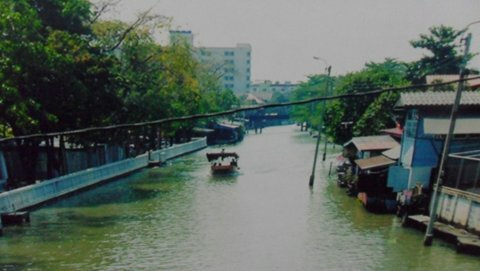 Klong Dan (dan – customhouse which used to be in the area) the main canal in the district links Bangkok Yai canal (the old course of the Chao Phraya) to the Tha Chin River in Samut Sakhon and it was main thoroughfare in the area for commerce and transportation in the past. It’s a very old canal and has been mentioned in a poem from the Ayutthaya period describing a boat trip from Ayutthaya along the Chao Phraya, Klong Dan and out to sea. It’s also a vital channel for moving troops to western Siam. In the reign of King Rama I (1782 – 1809) troops were moved along Klong Dan to Kanchanaburi to face a Burmese invasion. Again in 1820 during the reign of King Rama II (1809 – 1824) there was a threat of war with Burma. His son, Prince Chetsadabodin (later King Rama III) led an army through Chom Thong via Klong Dan en route to Kanchanaburi to counter the Burmese threat. 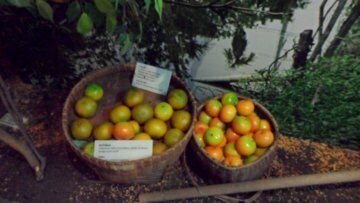 The area was very fertile as it was irrigated by a network of canals, man-made and natural which was able to support vegetable farms, orchards and rice fields. The district was also a source of local culture and art which have become an invaluable heritage. Chom Thong in the past was mainly farmland. 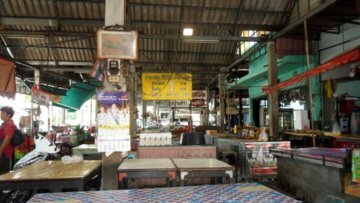 The rich agricultural produce in the area was transported along the network of canals to Klong Dan and the banks of this canal became the main concentration of commerce and daily life. 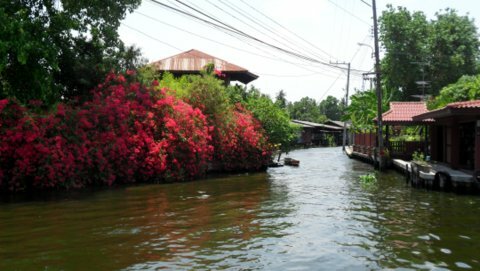 With very few roads and bridges in those days, Klong Dan provided an important link between Bangkok and the western Thailand. The canal had different names as it flowed through areas and adopted the name of the area it was in e.g. Klong Sanam Chai, Klong Bang Khun Thien, Klong Bang Kradi, Klong Saam Dam. 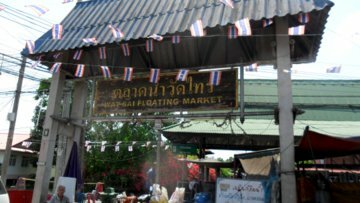 The main trading centre was the floating market at Wat Sai on the banks of Klong Dan which was filled with boat vendors selling their wares. At the peak of its popularity, the area was so crowded with boats that a policeman was needed to regulate boat traffic! 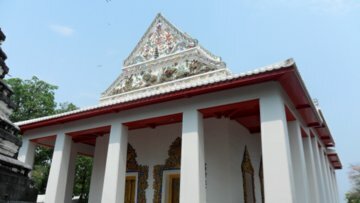 There are 16 temples in Chom Thong and three are featured here to reflect the blend of Thai and Chinese architecture and design that was popular during that period. 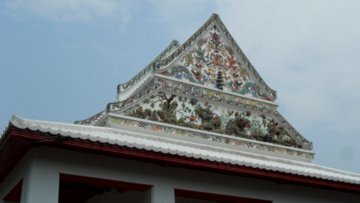 In 1820 when Prince Chetsadabodin passed through the district, he stopped at Wat Chom Thong and vowed to renovate the temple if he achieved victory. Though the war didn’t take place, he carried out his vow seven months later. The temple was renovated with a mix of Thai and Chinese and renamed the temple Wat Ratcha Orasaram Ratchaworawihan (temple of the son of a king) and designated a royal temple in honour of his father. 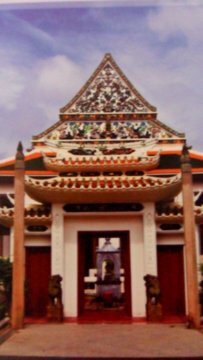 When the prince became King Rama III, he renovated two other temples in similar fashion, Wat Nang Nong Worawiharn and Wat Nang Ratchaworawiharn. The temples in the Third Reign with their strong blend of Chinese and Thai architecture and design were a departure from tradition. As a result, they were known as "Wat Nok Yang" (unconventional temples). Here are some of the cultural practices and festivals in the district as preserved in the Chom Thong Museum though not all of them are practised today. During Songkran chedi (round pagodas) are built in the grounds of Wat Bang Khun Thien Nai. The sand is left at the temple for future construction or repairs. 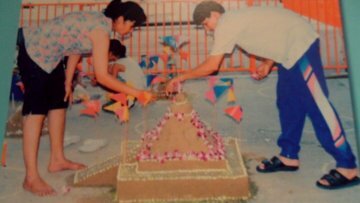 In 1999, the Buddhist Lent candle boat procession was revived. The procession takes place along Klong Dan as candles are presented to the temples along Klong Dan. After the Buddhist Lent, new robes are presented to monks as part of the kathin ceremony at Wat Bang Khun Thien Nok. This is done in the special Chulakathin tradition in which the robes must be sewn in a day. Boat races at Wat Bang Khun Thien Klang used to be another activity after the Buddhist Lent. But this is no longer carried out. 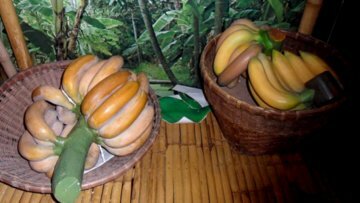 Chom Thong was famous for its fruits like tangerines from Bang Mot, lychees from Kung Linchi, bananas from Bang Khor, coconuts, betel leaves and nuts. The construction of the dam across the Chao Phraya upriver at Chainat in 1954 to irrigate rice fields of the central region reduced the amount of fresh water available in Chom Thong. This increased the salinity of the water in Klong Dan and the farms, orchards and rice fields that depended on the canal for irrigation gradually disappeared. Heavy floods in 1983 sealed the fate of the farmers. Only a few small holdings remain today. 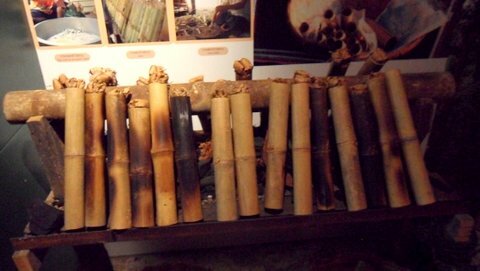 Khao lam is a Thai delicacy consisting of sticky rice, coconut milk, sugar and black beans barbecued in bamboo tubes. The area on the west bank of the canal between Wat Sai and Wat Singh was famous for this delicacy. Today, khao lam is hardly seen in Chom Thong. However khao lam is still widely sold in the eastern provinces like Chonburi and Chachoengsao. 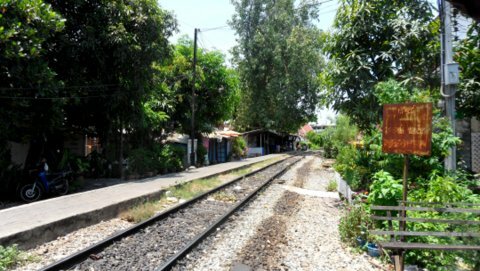 The major change to Chom Thong came with the building of the Mahachai railway from Pak Klong San in Thonburi to Mahachai in Samut Sakhon in 1905. The line passed through Chom Thong and became the main means of transport of people and products. In 1961, the stretch of railway from Wong Wian Yai to Pak Klong San was closed to build Charoen Rad Road (not to be confused with Charoen Rat Road on the east bank of the Chao Phraya near Rama III Road). Today the line terminates at Wong Wian Yai. The waterways started to lose their importance as a channel of transportation as more roads, bridges and automobiles were added to the changes in the coming years. In the 1950s economic development and urbanization brought an even greater change to the landscape of Chom Thong. New bridges across the Chao Phraya brought more roads and urbanization. Chom Thong soon lost it rural character. The Silom line of the skytrain passes just north of Chom Thong serving the area with the Wutthakat station and the terminal station at Bang Wa. Wutthakart, Ekachai and Chom Thong Roads are built-up and heavy with traffic like any part of Bangkok. However when I got off the main road to the areas closer to the canal, life is quieter. The atmosphere along Klong Dan is peaceful and scenic. It’s a wonderful place to spend a day. The area has taken a more residential air with some very pretty houses by the canal. At Wat Sai floating market, the only thing remaining from the old market was the sign board on the arch. Only a couple of food stalls were open. One of the vendors explained that the floating market closed down years ago. She can’t even remember when. 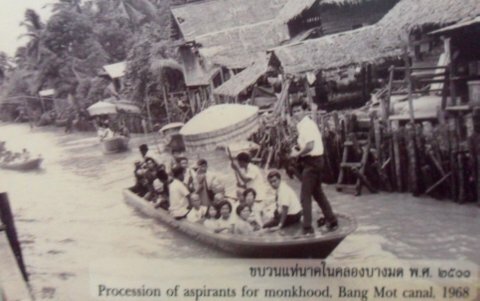 With the building of sluice gates along the canals, the boat vendors were unable to travel to Wat Sai. Coordinating with the authorities was just too much. Today the market is a normal fresh food market that opens early in the morning to serve the local residents. By mid-morning, most of the stalls were finished for the day. Canal travel was also affected with more roads and better public road transport. Furthermore the gas prices for land vehicles were cheaper than boat engine fuel. She had to travel by a longer distance by road to get home, but it was cheaper. 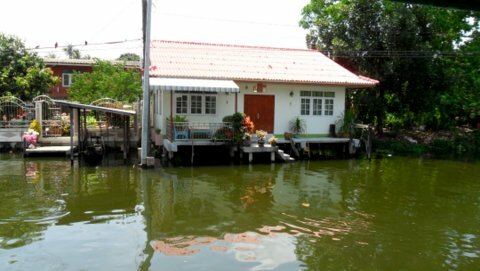 Her home was a short distance away along Klong Bang Mot that’s perpendicular to Klong Dan but the boat fare was more expensive. The train along the Mahachai line also provides free rides for passengers. 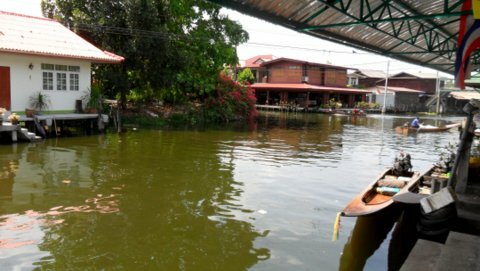 As a result of all these factors, the regular boat service along Klong Dan has ceased. Canal traffic has dwindled to a trickle of passengers who were prepared to charter the entire boat or boats for personal use. However the quiet life style along the railway line still retains the rustic charm of the past. Residents set up stalls along the track selling food and drinks. A shopkeeper was taking a late morning nap while others sat by the side of the track chatting, their peace interrupted every hour or so by the passing train. Chom Thong Museum preserves the memories of a way of life in a very old district in Bangkok that has completely been transformed in a space of half a century from rural to urban. Today, the temples, Klong Dan, the Mahachai line and some festivals are the only visible evidence of what’s left. Take the Silom line of the Bangkok skytrain to S11 Wutthakat station. From there get a taxi to Wat Yai Rom in Soi 33 Rama II Road. If there are no taxis at the train station, walk to Wutthakat Road to get one. If you are feeling adventurous, take the Mahachai line from Wong Wian Yai station to Wat Sai. Wat Sai is the third stop, Wong Wian Yai – Talat Phlu – Wat Sai. 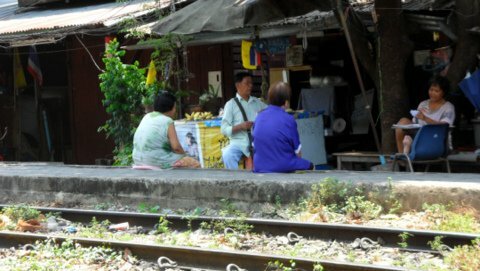 Don’t expect a proper train station at Wat Sai, it’s just a wooden shack. You won’t even know you are there. After Talat Phlu station, you will pass the Our Lady of Lourdes Convent. Wat Sai is the next stop. Train rides are free for Thai nationals and 10 baht for foreigners. For the first class air-conditioned carriage you pay 25 baht more when the conductor comes round to check the tickets. However on this trip, the train was about to leave when I arrived to buy my ticket. The staff member just gave me a ticket and waved me on. If you intend to return to Wong Wien Yai by train, make sure you wait on the side of the track closer to Wat Sai. The train doors open on the right. For more on this quaint railway service, please see Maeklong-Mahachai line. Thank you to the residents around Wat Sai for their helpfulness in providing information on the current situation. I am grateful too to the residents along the railway track for their information on the train service. They even knew the arrival time of the next train! If I didn’t ask, I wouldn’t have known there is a train station there. I would like to thank to the staff at the Chom Thong Museum for being able to photograph the exhibits in the museum and for the information on Chom Thong. To return to Bangkok Museums. This is my second e-book and the first in the series of travel journals on my trips to explore the various provinces in Thailand. This edition, which covers my travels from late 2009 to mid-2013, will guide you to historical sites, cultural monuments and exquisite Thai handicraft, across a vast spectrum of cultural and ethnic diversity. You can have a virtual tour with this e-guide book or take the first steps yourself in this journey through Thailand.